As a food blogger, I have the habit of constantly exploring new flavors and cooking techniques. However, there are certain habits that I rarely deviate from. For example, making braised pork ribs using the recipe passed down from my grandma, and serving it with steamed rice. Whenever I serve this dish, I remember the good old times back in China. 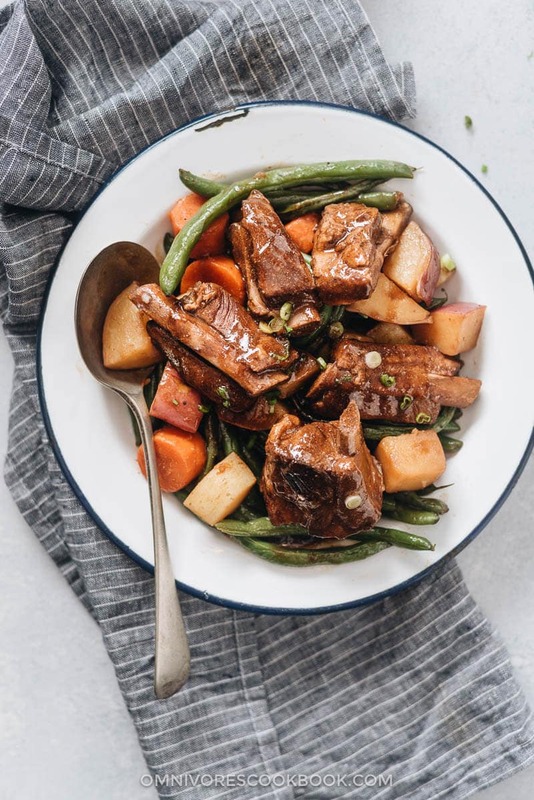 My mom used to pack my lunch box with some saucy braised ribs, steamed seven-grain rice, and a freshly made vegetable stir fry. Everything was made from scratch. I didn’t realize how lucky I was until I moved to the US, where I have to cook everything in my own kitchen if I want a family-style meal. Just like with other family dishes, my mom never needed a recipe for this dish. 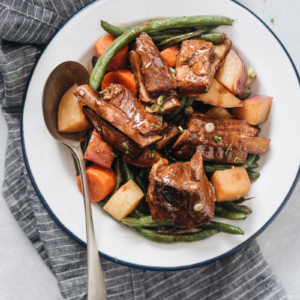 When I asked her how to cook my favorite braised pork ribs, it took her forever to measure everything and pass me a recipe that was still ambiguous. Today, even though I can still taste a subtle difference between our renditions of the dish, I’m lucky to enjoy the taste of home often. My husband loves the dish so much and he said it is just as good as he remembered. Compared to many recipes out there, my family does a few things differently, to make the cooking easier to approach and the results extra delicious. (1) Blanch the ribs instead of browning them. I’ve seen many braised meat recipes require a browning procedure, where you “seal the flavors” into the meat and create a good texture. Not in this recipe. The browning process is messy, creating a lot of smoke and oil splatter. So my mom never browns the meat, but blanches it instead. 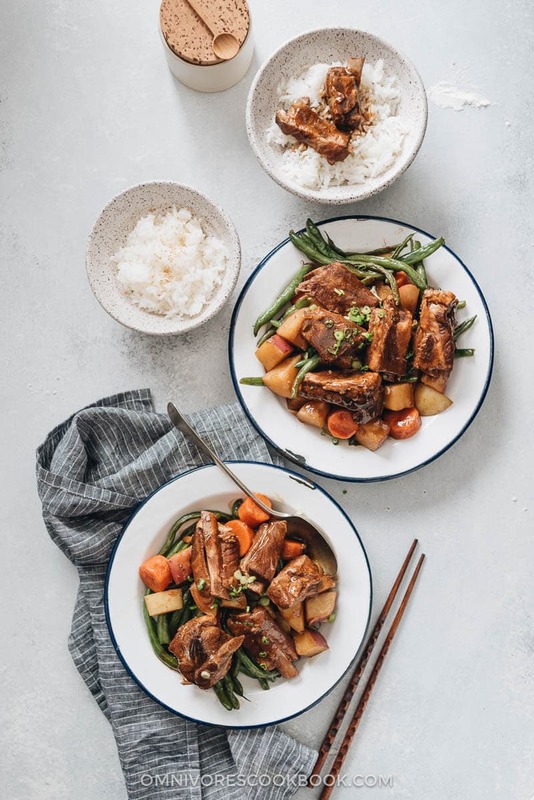 You still get a great texture and flavor in the end, with tender, fall-off-the-bone pork, soaked in a scrumptious sauce. (2) Add salty seasonings later. My mom claims this method makes tenderer meat in a shorter cooking time. You add only the ingredients that do not contain salt at the beginning. Adding fresh aromatics at the very beginning of cooking is crucial because it helps eliminate the gaminess of the pork and adds fragrance to the broth. On the other hand, adding salt too early will tighten up the pork and require a longer braising time. 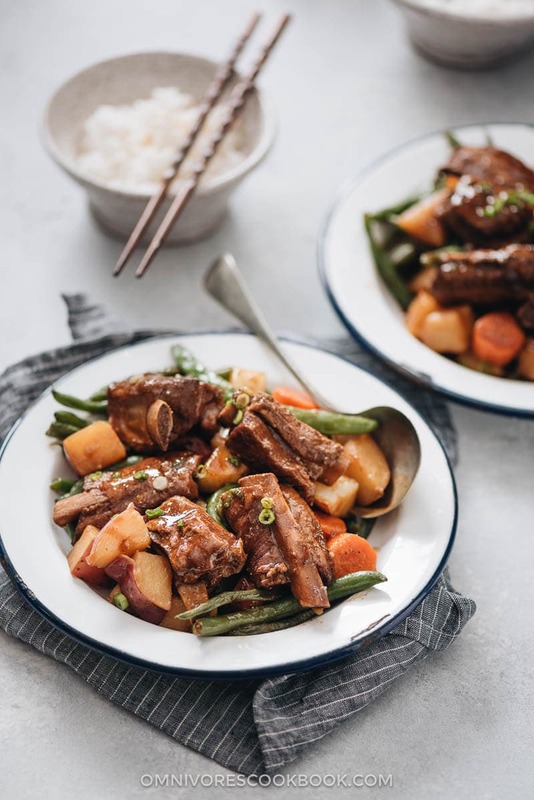 So always add soy sauce and salt when the braising is halfway finished, when the meat starts to turn soft, but still has enough time to absorb the flavor and the saltiness. 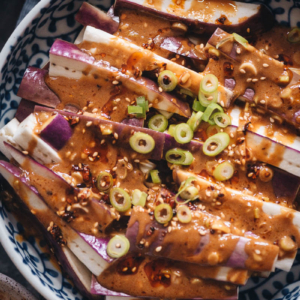 There is one ingredient in this recipe that you might not be able to obtain easily outside of China – the red fermented bean curd. It’s a preserved tofu product cooked with soy sauce, rice wine, and sesame oil. I call it Chinese cheese, since its texture is similar to that of soft cheese and its taste is a bit stinky. In this recipe, my mom uses red fermented bean curd to add a complex flavor to the sauce. There are two types of fermented bean curd: white and red. The two have very distinct flavors. So, do not use the white type in this recipe. If you can’t find the red fermented bean curd or just don’t like its flavor, skip it. The pork will still taste very nice. Despite the fact that I’ve been following my mom’s recipe closely, there are a few things I do slightly differently. Instead of reducing the sauce by cooking it longer and stirring the pork constantly, I use a cornstarch slurry to thicken the sauce at the end. Not only does it shorten the cooking time, but it also makes the pork less likely to stick to the pan. If you still prefer to reduce the sauce by cooking it down, you can use a slotted spoon to transfer everything into a big bowl and cook the sauce down until it thickens (it could take anywhere from 15 to 30 minutes). This way, I can make a one-pan dinner with little effort. My mom rarely does this because she usually freezes the pork in small batches, and cooks vegetables with the pork when she reheats it. If you prefer to freeze the pork in advance for meal prep, do feel free to leave out the veggies. 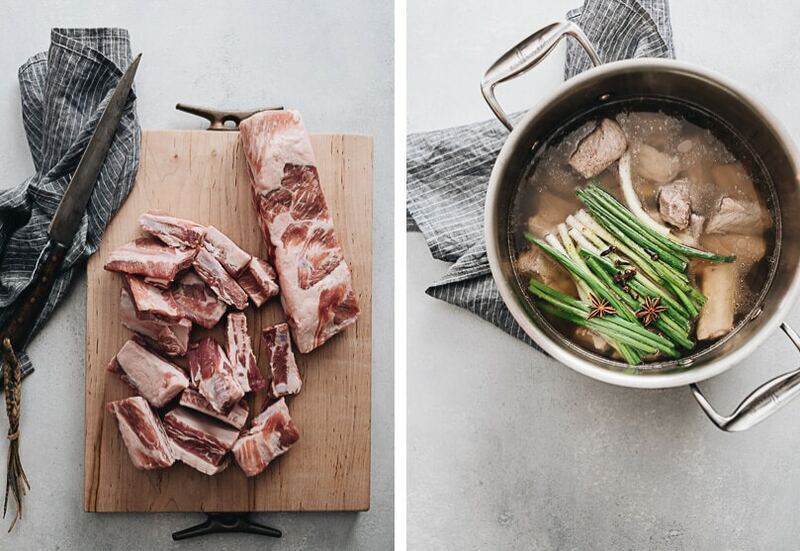 Add pork ribs to a large pot and cold water to cover. Bring to a boil over medium high heat, then turn to medium heat. Boil for 5 minutes while skimming the foam off the top with a spoon. Add ginger, green onion, nutmeg, star anise, cloves, and cooking wine. Turn to low heat. Cover and simmer for 40 minutes. Stir occasionally. Add light soy sauce, dark soy sauce, sugar, and salt. Add the red fermented bean curd into a small bowl and add a few spoonfuls of hot broth from the pot. Smash with the back of a spoon until the bean curd dissolves. Pour back into the pot. Simmer uncovered for another 40 to 50 minutes, until pork turns tender but is not quite falling of the bone. (Optional) Add the vegetables. Continue simmering for 15 minutes, until the vegetables turn tender. Serve pork ribs with steamed white rice or noodles. Enjoy! Store the pork ribs in an airtight container in the fridge for up to 1 week, or in the freezer for up to 1 month. I’ve seen red and yellow fermented tofu in some stores where I live but could never get a clear answer when I asked the shop keeper how to use the ingredient (language barrier). Thanks to the internet and your website my curiosity is solved. But there is one last question I have. Do I mash the tofu or use it as is when adding to the recipe? Thank you, I’d like to try your Mom’s spare ribs very soon. 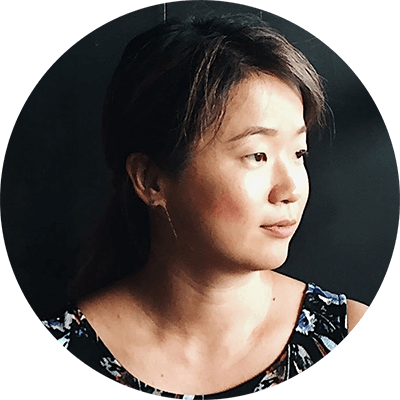 Hi Alika, I’m so glad to hear you can find the fermented tofu and would like to try it out! This is quite unknown out side of China, but I like it a lot. To answer your question, you should mash it and add it to the broth. It should become a part of the sauce at the end of the cooking. You will probably have leftover tofu after making this. 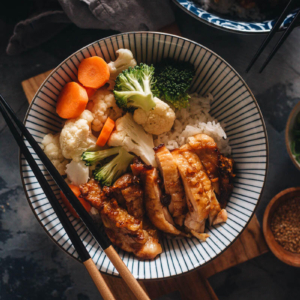 You can serve it with noodle soup and congee, to add saltiness to these dishes (like pinch a small piece of the tofu and eat with the noodles). It’s a bit like putting olive or cheese on top of a green salad. You can also use it in stir fried dishes, to add umami and saltiness. But Make sure to dissolve it with a bit water before adding. Just to verify, does the nutmeg remain whole, or is it split or grated? Hi Tom, the nutmeg remains whole in this recipe. Oh god, Wangzhihe’ red fermented bean curd is so delicious. Called Fermented Rose Bean Curd for those looking for it. Could a pressure cooker be used to simmer the ribs? Perhaps 20 minutes? You mentioned earlier on in the explanation that your mom used to pack these ribs with seven grain rice. Here in Japan people love to have multi grain rice as well. What were the seven grains that your mother used in this rice? Of course, one of them must’ve been rice! What is the message of Footnote 1 noted with the pork ribs in the ingredients? Hi Maggie, what’s the difference between this and a red-cooked dish? Hi Kimi, you can actually call this one the red cooked ribs. The only tiny difference is the typical red-cooked dish brown the meat in a wok with sugar, which gives the pork a more vibrant color. Although we rarely do that step because it’s too messy. OK on the sugar, Maggie. So, I couldn’t resist trying this dish right away. As it happened, I needed to do some shopping this week so I picked up the fermented bean curd and some delicious, fatty pork ribs. I decided to cook Chinese radish with the potatoes and carrots so ended up cooking the ribs in the morning and the root vegetables later in the day. My family loved the dish! I’m just wondering what instructions to tell my local butcher to get him to give me ribs the way I want them for this recipe. If I ask for baby back ribs to be cut in half, will this do the trick? I was dismayed not to have fresh ginger in the house so I used a bit of dried, ground ginger and a splash of rice wine vinegar to give it a little kick. This recipe is so easy and even without all of the ingredients it was absolutely delicious! Thank you so much for sharing! My husband is Chinese and this is one of my standard go-to’s for when I want to make Chinese food for him. It’s so good!! It works for both our American friends and Chinese in-laws. My one year old is a huge fan too! We’re also in Austin and love your traditional recipes!! Hi Gamble, I’m so happy to hear you enjoy the dish! It’s a family recipe and I’ve been eating it growing up. I’m glad that you enjoy the dish as much as I do 🙂 Have you checked out the newly opened H Mart? It’s nice that now we have one more option to shop Asian grocery! 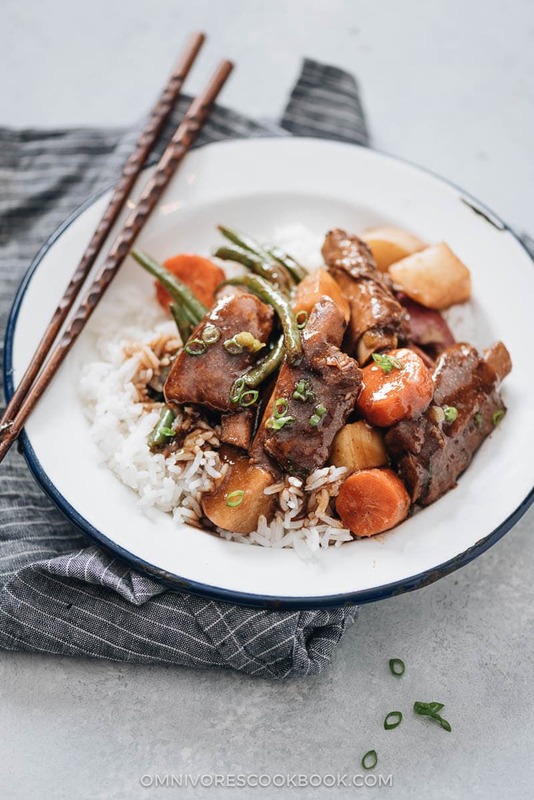 very nice and easy….I live in China, can’t find cloves and nutmeg very easily but really liked the red bean curd…that was an inspiring ingredient. How much water do you use for this recipe? And can I throw out the water after the first boil to get read of the scum and use fresh water and boil again before adding the other ingredients? I would really love to try this recipe this weekend. And finally get to use my red fremented bean curd I got last month. Hi Mai, yes, you can throw out the water after the first boil to get rid of the scum. It doesn’t matter how much water you use for the first time. The second time, only use enough water to cover the pork. If the water runs too low at the end, you can add some boiling water to the pot. The water amount is rather flexible because you can always control how thick it comes out by adding the cornstarch slurry. Happy cooking and hope you enjoy the dish! Luurve it! No mess to clean up n best of all no oil required! Healthy dish. Thanks for sharing dis recipe to us!!! My family keeps Kosher so we don’t eat pork. Can I use beef short ribs instead? 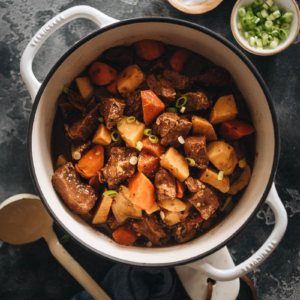 Yes, this recipe works for short ribs too, but you might need a longer cooking time (depending on the size of the ribs you use). Hi, I believe you’re missing the footnotes for this recipie! Wow, I just found the best looking ribs at the store today! Will definitely try this recipe. I’m impressed that the sodium level is only 625 mg! For health reasons, is there any sodium ingredient I could cut back further? Maybe the soy sauce in lesser amounts? Thanks. I would reduce the salt first. You can also use soy sauce to replace light soy sauce, which reduces the sodium further.